Glasses have been the most popular and widely used gemstone simulant for centuries, which has the capability of imitating any gem material, whether organic or inorganic, transparent or opaque, any colour and even phenomenas like chatoyancy, sheen, adularescence, opalescence, orient, colour change, etc. The identification of this gem simulant is however, not a problem for gemmologists or traders with fair degree of knowledge in gem identification. The presence of gas bubbles, swirl marks, or devitrification effects readily identify the glasses. Figure 1: These two specimens weighing 17.05 carat (octagon step) and 1.79 carat (oval mixed) were identified as glasses displaying unusual straight zones. At GTL Jaipur, I received for identification two green specimens (figure 1) weighing 17.05 and 1.79 carats submitted as emeralds, which turned out to be glasses. The 17.05 carat, octagon step specimen measured 14.94 x 12.10 x 7.43 mm while 1.79 carat, oval mixed specimen measured 8.87 x 6.83 x 4.23 mm. 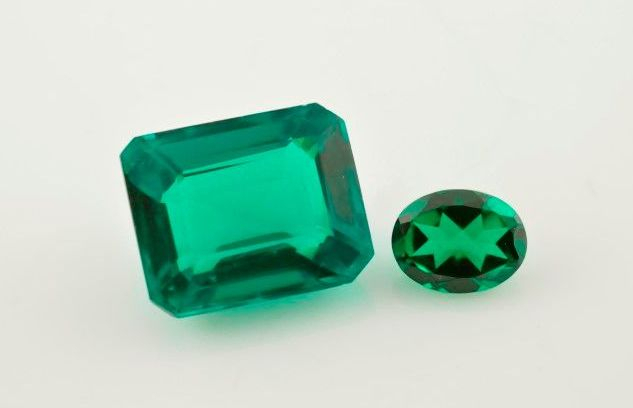 Initial observations indicated these specimens as emeralds because of their typical colour shade; both specimens were of exceptional colour and clarity. These exceptional qualities were sufficient to raise the doubts regarding their origin. 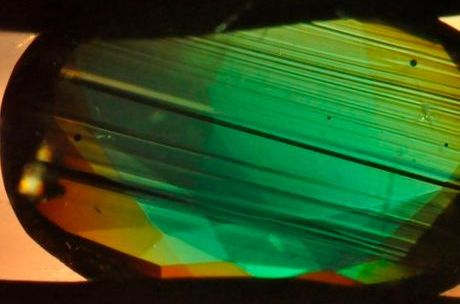 Both the specimens displayed ADR effect under polariscope, which was sufficient to rule out the possibility of emeralds. The 17.05 carat specimen displayed single refractive index reading 1.730 and hydrostatic SG at 4.36, while 1.79 carat specimen displayed RI at 1.630 and SG at 3.03. Both specimens were inert under ultraviolet lamps (LW and SW) and did not display any absorption features in the desk-model spectroscope. These properties indicated these specimens as glasses. When magnified, striking features were observed. Both the specimens displayed series of sharp and straight lines (figure 2, left) running throughout the stone from one end to the other. 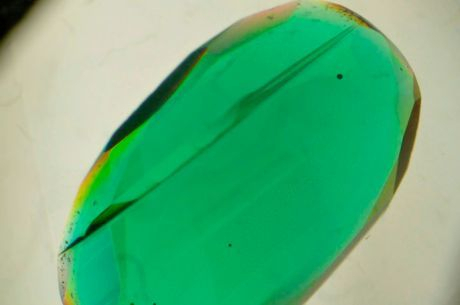 Such lines are associated with the growth lines or zones in natural gemstones. At few angles, some of these lines appeared as planes with sharp edges running throughout the stone. In addition, only few scattered gas bubbles (figure 2, right) were present in 1.79 carat specimen. However, with the use of some of the classical gem testing instruments, these glasses were readily identified, but may pose problem when attempt is made to identify only with a 10x lens as usually the case with the jewelers or field gemologists.